Keep an eye out for these behavior cues to make sure you are in place for the best interactions on your next sea lion dive. 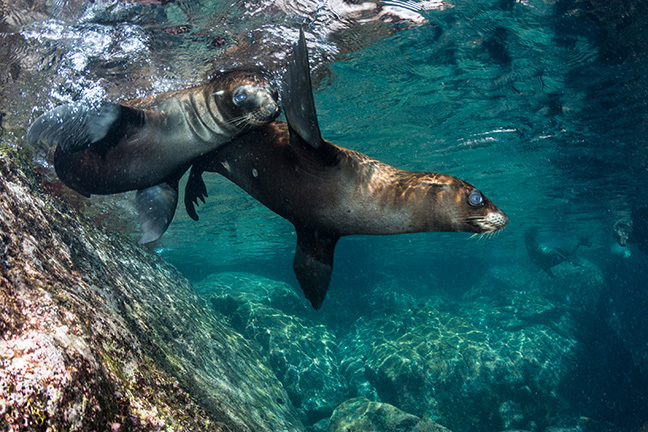 Two young sea lions play in the clear waters of Los Islotes. Photo by Brent Durand. 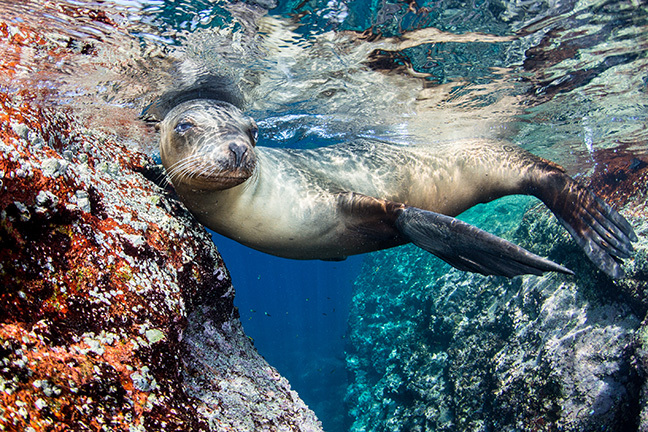 Diving with sea lions is the ocean equivalent to playing with a friendly dog at the park. The pinnipeds are full of energy… or lazily dozing off in the sun. They will bark, swim around in speedy arcs, play with toys, and even perform acrobatic moves that make you think it’s a private show. If you have dived with sea lions, then you know what I mean! 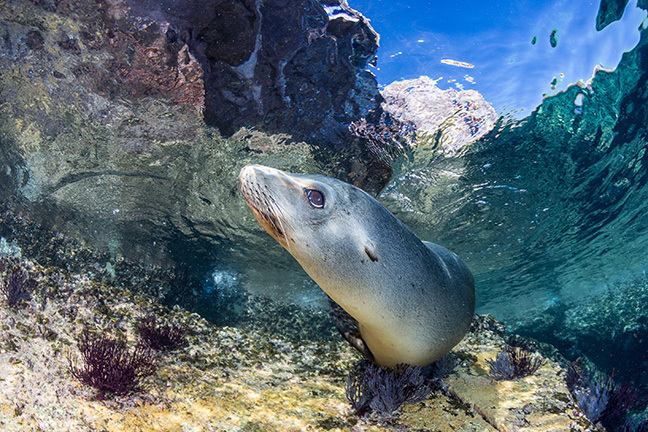 Sea lions have wide ranging habitat, including both temperate and cold water regions such as Mexico’s iconic Isla Los Islotes, the Galapagos Islands, California, Vancouver Island, New Zealand and Australia. Like all marine mammals, sea lions have complex social structure and behaviors. Learning about these aspects of their lives will help you to have the best dive possible with them, by putting yourself in position for the best interactions. As an underwater photographer, this is what I am looking for on every sea lion dive. 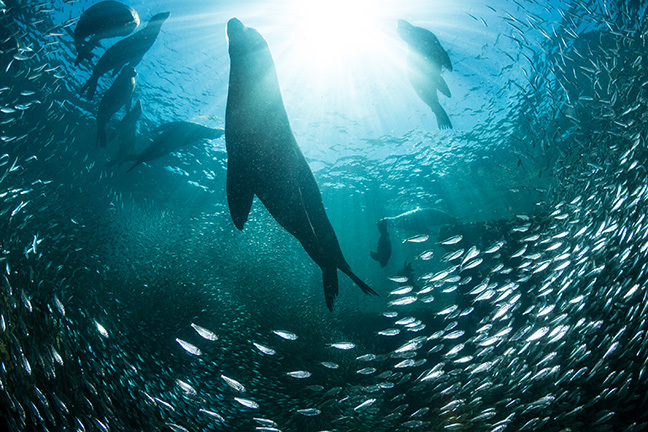 Within the larger colony, sea lions form many different subgroups. Dominant males will take charge of a harem of females, protecting them, and their territory, from other males. Being the boss is a tough job, however, and these harems do shift as the males become tired from the constant work and lack of time to go hunt and stay strong. The fights between males can be very aggressive and violent, often leaving battle scars. As scuba divers, this is important to know, because the alpha male will be keeping an eye on you in the water. He will often swim by divers just so that they are aware of his presence and know that his territory is close by. The bull sea lion will also warn advancing divers of their intrusion—first, by indirect swim passes. If divers proceed further, the bull will then start making more direct approaches, barking and blowing bubbles. This is definitely the “go-no-further” point of a dive site, and I have not seen anyone careless enough to approach further than this point. And that is because the females and the pups are the main attraction at a sea lion colony! Female sea lions and pups will also form subgroups in the colony. Mature females are often very relaxed, floating on the water and oftentimes found warming up (thermo-regulating) by floating with one fin sunning above the surface. These calm mammals will often let a calm diver slowly approach to spend quality time floating together, either enjoying the moment or shooting a few photos. The pups gather in groups of similar ages and will steal the show at any sea lion colony. At ages of a few months to two years, these pups love to play. They will chase each other at top speed in the water, drawing lines and arcs that even breach the surface. The pups will wrestle with each other in much the same fashion as young (land) dogs do, and will often get excited if you show excitement as a diver. Many sea lion divers carry little toys to entertain the pups, as pups cannot resist coming in to investigate and mouth the colorful object. 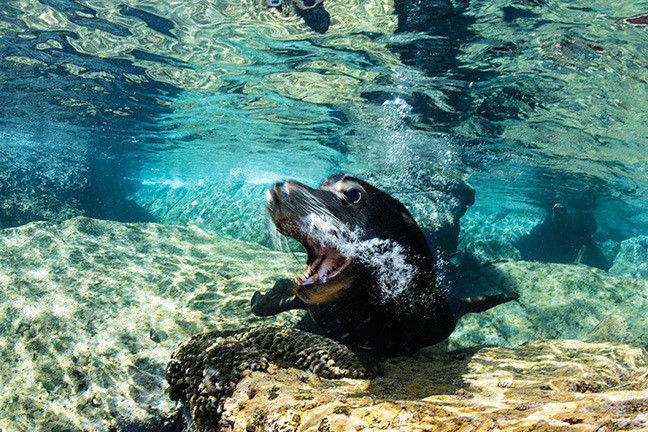 A classic scene is watching one or even three sea lions nibble and tug on your fins as you try not to giggle through the regulator. The excitement of diving with these sea lions pups is what keeps divers coming back for the experience again and again. Brent Durand is a digital media content producer and publisher. His work covers adventure from the snow to the oceans and the marine life we find there. His photography has been published in print worldwide, in advertising and across the web in a variety of outdoor industries. He has a reputation for writing insightful yet simple camera gear reviews and speaks regularly on photography technique, dive adventures and trends in the photo industry. He has led underwater photo workshops in the Bahamas, California, Indonesia, Mexico, the Philippines and Sri Lanka, and has a popular monthly newsletter full of photo tips and tricks. He is also a dedicated brand ambassador for BARE Sports, Stahlsac and Kraken Sports. For more information, visit: BrentDurand.com.